I found some lovely cherries at the market and ended up buying a few too many. Though we are loving eating them, I felt like making something using cherries. I already baked a cake last weekend so skipped that thought. 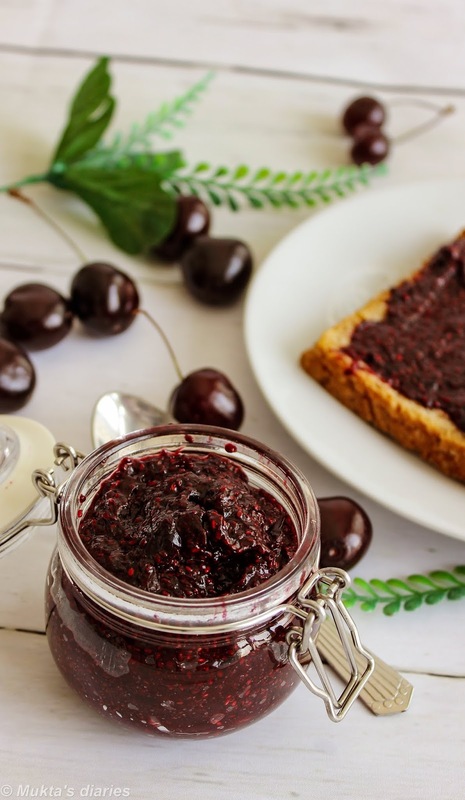 Today morning we were having toast for breakfast and thought of jam and toast and that was it, cherry jam! :). 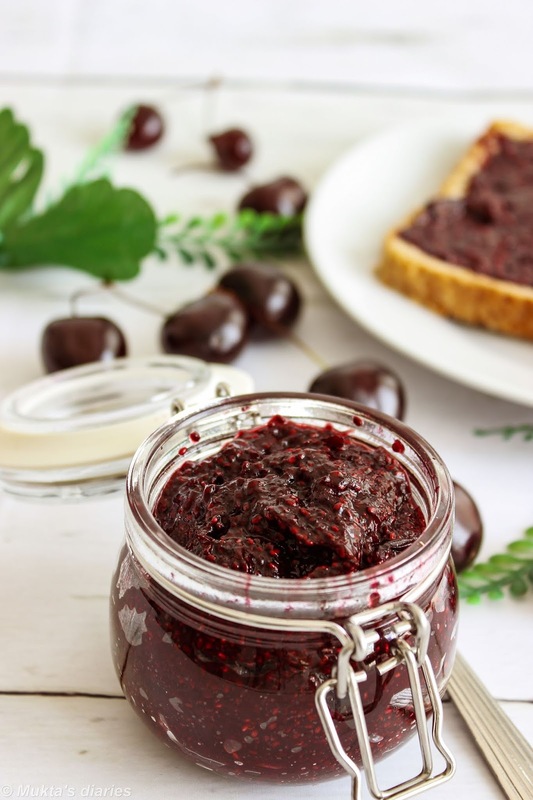 I have seen quite a few chia jam recipes doing the rounds so thought I'll give it a go too. Unlike a store bought jam, this one has very less sugar. Although the cherries I got were quite sweet, I wanted to make the jam a little sweeter so I have added some date syrup but you could use other sweetners or skip it completely. The jam takes hardly anytime to make. The only time consuming bit was the pitting of the cherries but you could just use pitted ones. In a heavy bottomed pan, add the pitted cherries and star anise and cook for about 5-7 minutes till the cherries start to soften. Remove the star anise and mash the cherries lightly with the back of a spoon. Add the date syrup and give it a mix. Take it off the heat and add the chia seeds. Spoon the jam into clean airtight jars and leave to set in the refrigerator, for at least an hour.